1. 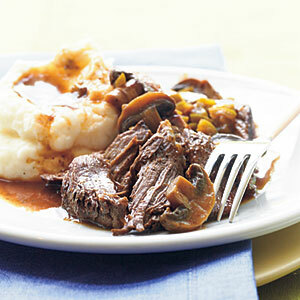 Place mushrooms and bell pepper in a 3 1/2- to 4-quart electric slow cooker coated with cooking spray. 2. Combine ketchup and next 4 ingredients in a small bowl, stirring until blended. 3. Heat a large nonstick skillet over medium-high heat. Coat pan and roast with cooking spray. Cook 3 minutes on each side or until browned. Place roast over vegetables in cooker; pour ketchup mixture over roast. Cover and cook on HIGH for 1 hour. Reduce heat to LOW; cook 6 to 7 hours or until roast is very tender. Serve vegetables and sauce over roast.